I’m still quilting and finishing tops that I stitched up last winter in Arizona. I made this top all from Cotton and Steel FQs. I used Bonnie Hunter’s tutorial called Scrappy Trips. You can find it here. I started calling it Sea Sick because it kinda made me feel that way! This is one busy mix! It is hard to photograph a big quilt; this one is 96 by 96 inches. This next pic shows the lengths Mr. Wonderful will go through to support my crazy ideas. I told him I wanted a full on shot so he used his drone to take some of these photos as well as a video at the end of this post. ​​I quilted this top with a pantograph called Malachite, available from Urban Elementz. I wanted a lot of texture, but I knew details sure wouldn’t show. This next pic shows the back. I love how it looks on my guest room bed! This entry was posted in Bed Quilts, Finishes, Modern Quilts, Pantographs. Bookmark the permalink. 28 Responses to Finish It Up Friday ~ Sea Sick! Amazing! The picture of it on the bed looks like a magazine picture! You’re featured tomorrow on Finished or Not Friday! Thanks for linking to Finished or Not Friday! 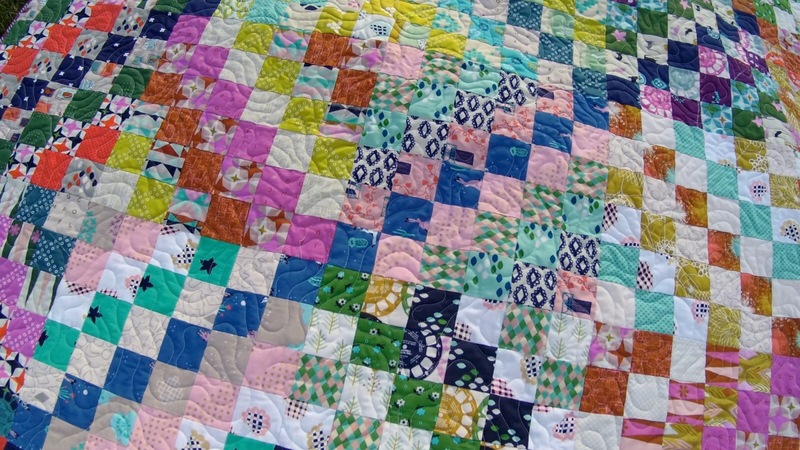 Your quilt is wonderful; I love all of the colors and patterns. 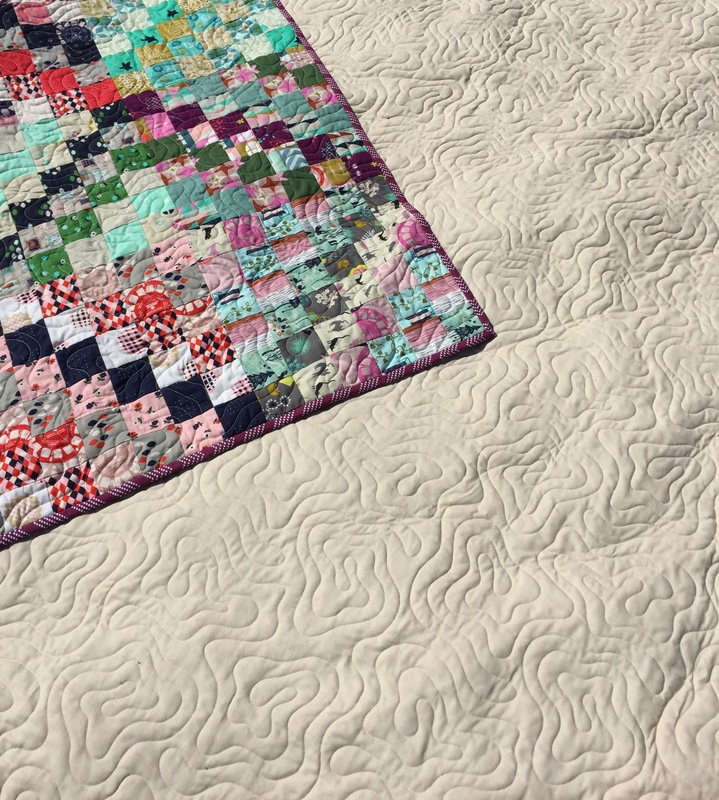 Your husband is a peach to photograph your quilt, using his drone (but I bet he loved playing with it, too)! A wonderful quilt, looks great on your spare bed! Love the video too! I love your quilt! 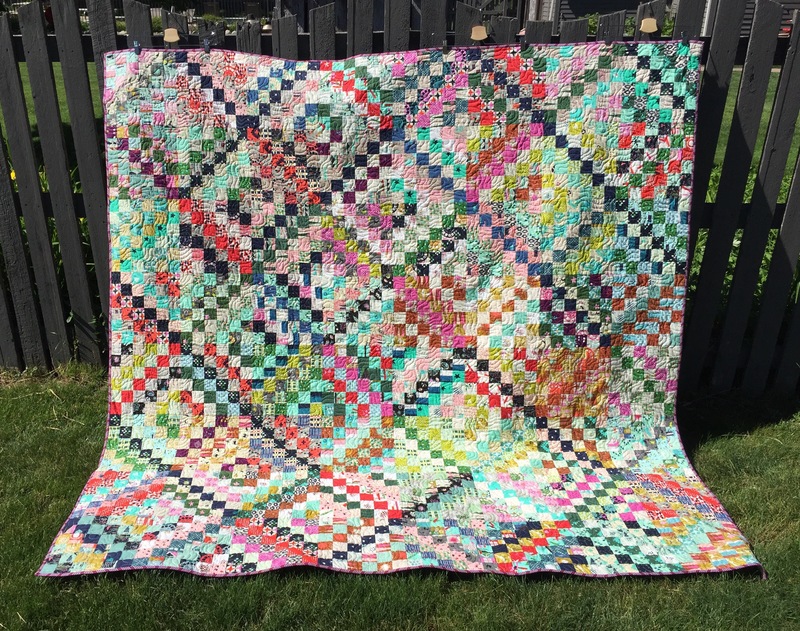 That pattern is one of the most fun quilts I have ever made! Thanks for sharing! Oh that looks wonderful with that headboard in your guest room! Very old fashioned and cozy looking even though the fabrics are bright and modern. And they are really scrumptious! What a great finish! How cool is that video! Love it AND the beautiful quilt! I never get tired of those scrappy trips–every one is a beauty. I have three going right now, one multi, one red/white/blue and one greens & purples. 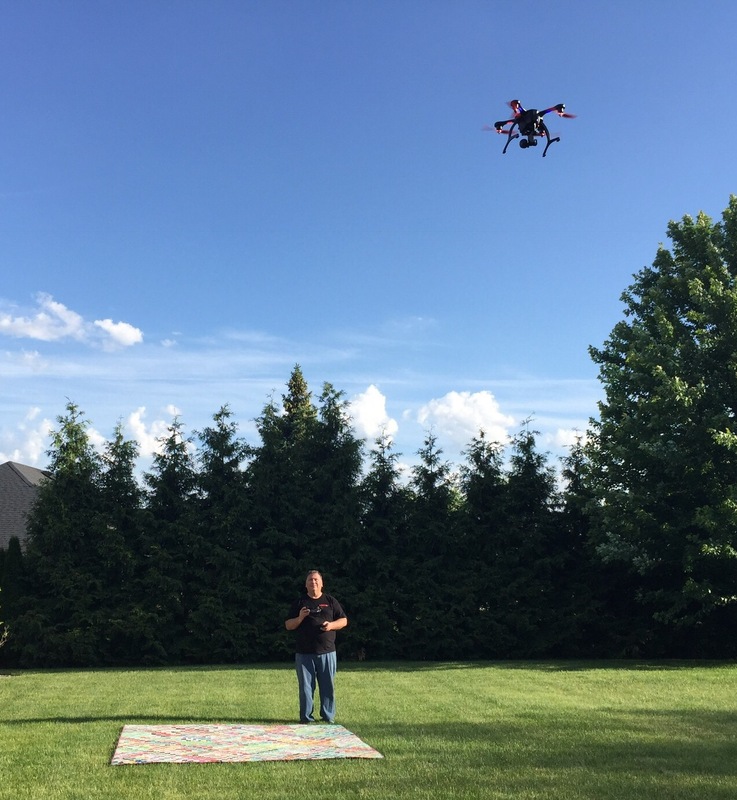 I can see it now, a quilt show using drones! I see a linky party in your future! Great finish! I love how you used the drone to get photos. LOL Creativity at its finest. I had to tell my husband about the drone taking pics. He was rather impressed. The man has to use his toys!! 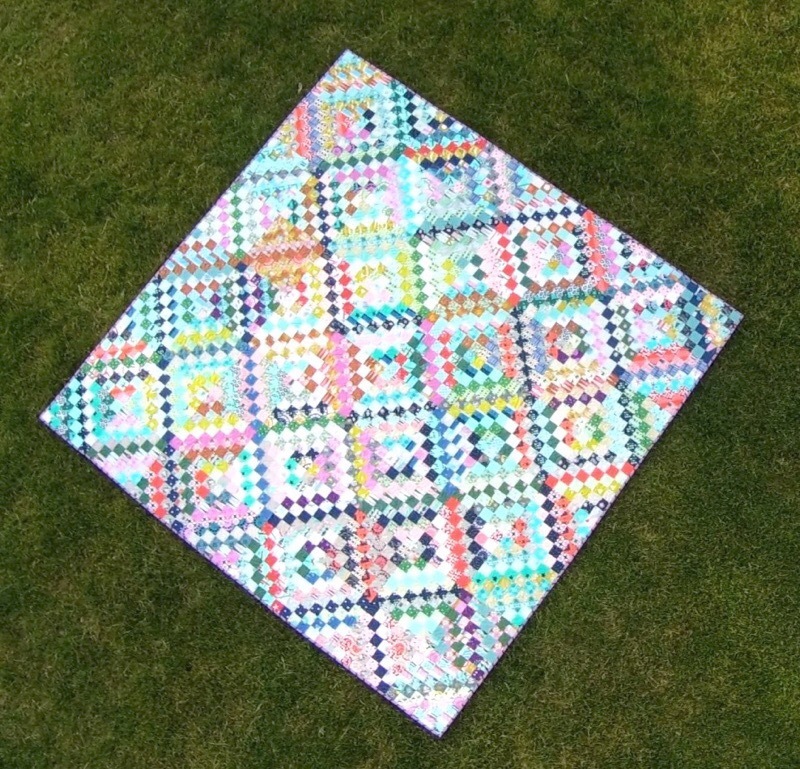 What a fun way to record the quilt! I love that there is no border either–very modern. I really like the quilting on this one, Katy. Mr. Wonderful truly IS wonderful. He’s very skilled at controlling his drone. You are so lucky to have Mr. Wonderful. Gorgeous quilt. Your quilt looks wonderful! I am so glad you followed through with it. Perfect for your guest room too. Now I’m going to speak to my nephew – he has a drone. And here I was just standing on a chair to take my overhead quilt photos. Very cool! Clever use of a drone! I want one!!! The quilt is gorgeous!! The quilt is just so happy and it looks great in your guest room. The drone idea was fun! 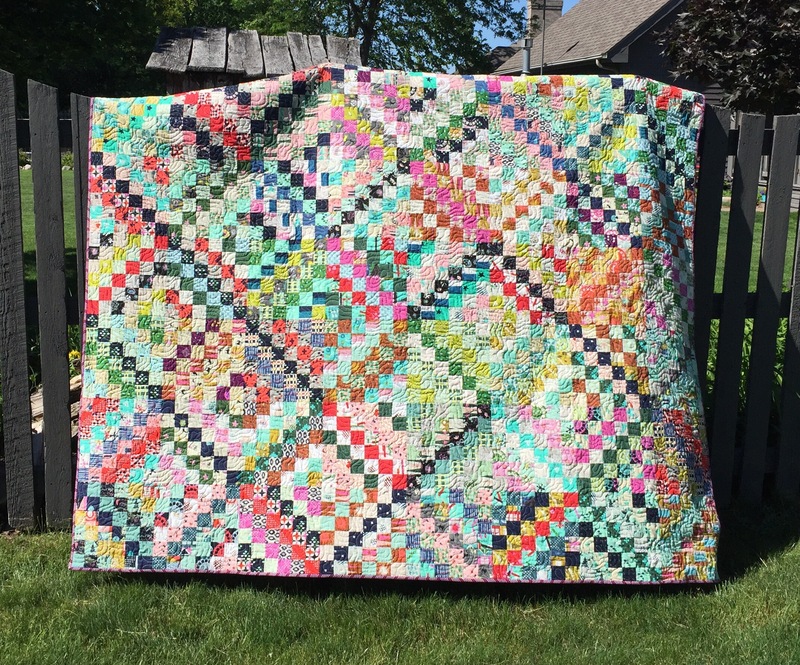 This quilt is gorgeous!! I love it! The colours are beautiful. What a wonderful quilt! 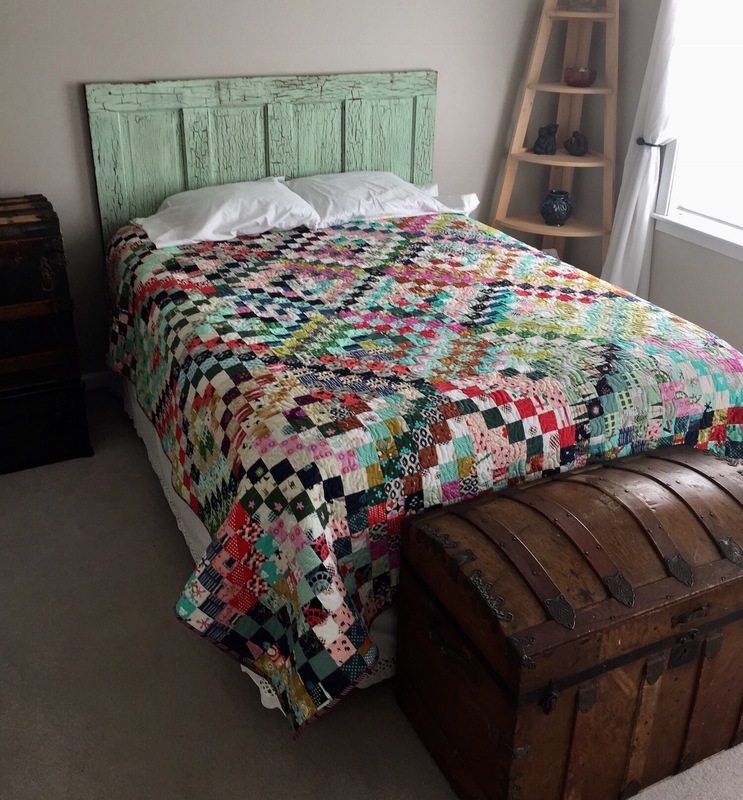 And a new way to photograph large quilts – thanks for sharing!